Sourcing 55% of content from archive footage, The Andy’s Adventures programme team are super green . This is much more environmentally friendly than filming from scratch because it minimizes travel and transport and its associated carbon emissions. 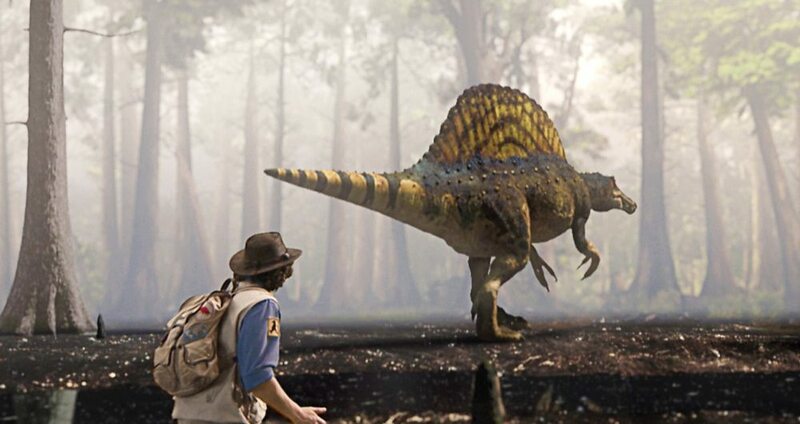 Andy’s Prehistoric Adventures has ‘recycled’ footage from Walking with Dinosaurs, Walking with Beasts and Plant Dinosaur to create 25 x 14 minute new episodes. The star of the show, Andy Day, is filmed against a chroma key/green screen background and the latest digital CGI technology is used to combine the presenter with the backdrops to create a thrilling journey through prehistoric time. This third series of Andy’s Adventures was filmed at The Bottle Yard studios in Bristol in a specially developed green screen studio. Lighting contractor 180 Rental based at The Bottle Yard provided the production with green screen lights that were 64% more energy efficient than those used on the previous series, being only 9kW as opposed to the 25kW as previously planned. At the Bottle Yard, the electricity supply was from mains power only, rather than diesel generators commonly used in film and TV. Using mains is a much more energy efficient way of working and so reduces carbon emissions even further. The sound recordist also used rechargeable batteries, cutting down on waste and saving even more energy. •	They cut paper usage by adopting an opt-in policy for production paperwork. All call sheets and production schedules were emailed – printed copies were only made available by special request. They also went eco with double sided and A5 printing rather than the usual A4 and they asked for all used paperwork to be returned for confidential shredding and recycling. Shredded paper rots a lot quicker than sheets and the production team were encouraged to add it to their compost. •	They eliminated single use disposable food and drink containers on set (no polystyrene cups and containers!). Their caterers, The Feastie Boys, provided reusable crockery and cutlery (no plastic!). Cast and crew were given re-usable water bottles, which were labelled with individuals’ names to be used throughout the shoot. Tap water was provided for refills, being a healthy and cheaper option, saving the production £700. •	Transport efficiencies were achieved by encouraging the staff to car share wherever possible. Some members of the team used public transport and bikes to commute to the Whitchurch studio base. The production pool car was put to good use transporting all cast and crew to and from the studio and central Bristol. As the team memo said, travelling is more fun with a friend! The Bottle Yard studios also work with cab company Studio Cars that use hybrid vehicles which have lower carbon emissions than standard diesel or petrol cars. •	The production staff also avoided journeys between Bristol and Salford, where CBeebies are based, by using the BBC’s telepresence facilities. This ‘virtual board room’ is a video conference facility which cuts down travel related carbon emissions and saves staff valuable time wasted on long journeys. •	The Andy’s production team were also encouraged to reduce, reuse and recycle at all times. They cut their stationery bills by re-using recycled materials from BBC Bristol HQ. Their museum set was recycled from the previous series, with a few new modifications. And at the end of the shoot, the set was taken by Dres’d, a scenery salvage company based at The Bottle Yard, rather than being sent to landfill. Andy’s production manager estimates that the production has saved £4500 on scenery costs from these actions. •	Recycling facilities for personal items were made available at both the production offices and at the studio. The production team were encouraged to use them as they would at home – washing plastic food containers first and putting things in the correct bins. •	The production team also measured their carbon footprint using Albert, a carbon calculator specifically designed for TV production. Their results showed that their carbon emissions were 8.04 tonnes CO2 per broadcast hour, so one third the average for other BBC programmes made in a similar way – filmed in a studio with VT inserts – which produce 23.7 tonnes CO2 per broadcast hour. Notably low carbon emissions were achieved by keeping their transport and accommodation to a minimum and by having a comparatively low studio energy usage.